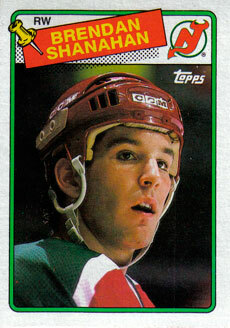 Brendan Frederick "Shanny" Shanahan (born January 23, 1969) is a retired Canadian professional ice hockey winger. 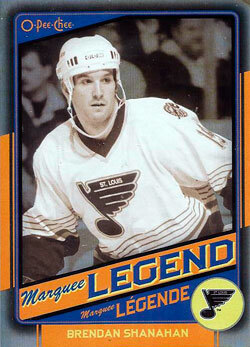 Originally drafted by the New Jersey Devils second overall in the 1987 NHL Entry Draft. 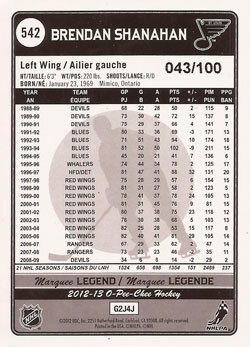 He spent the majority of his career with the Red Wings, with whom he won three Stanley Cup championships. With his physical play and goal scoring ability, Brendan Shanahan scored 656 goals in his NHL career spanning over 1,500 NHL games and, at the time of his retirement, was the leader among active NHL players for goals scored. Shanahan is the only player in NHL history with over 600 goals and 2,000 penalty minutes. Competing for Team Canada internationally, Shanahan won a gold medal at the 1994 World Championships, 2002 Winter Olympics, and a 1991 Canada Cup championship. Having won what are considered the three most prominent team titles in ice hockey, an Olympic gold medal, a World Championship and a Stanley Cup, Shanahan is a member of the elite Triple Gold Club. Brendan Shanahan currently works in the NHL office as the league's vice president of hockey and business operations.